There are two broad categories of writing in the Social Services. There are academic writing and practice writing. In the academic writing category I would place all texts, which are part of the knowledge base, governing rules, professional guidelines, or theory. In the practice writing category I would identify all written attempts to observe, formulate impressions, recommendations or plans regarding clients, or simulations of clients. There are formalized and reserved writing tasks (the psychosocial assessment, the intervention plan, the court report, etc.) as well as less restricted writing tasks, which underpin practice (progress notes and record keeping). Thus far, there is ambiguity regarding the role of the TTS (the social service worker, or technicien(ne) en travial social) in writing in the professional milieu. These workers represent the graduates of Cegep level social service three-year programs. They are not, at present, members of the professional order thus they are not able to write the reserved task documents. Despite this they are often found doing similar jobs, if not, in some cases, the same jobs as professional social workers. In these instances they are expected to perform based on the expectations of the agency in which they are working- where they receive the training regarding their professional tasks. Critical thought is integral to every step in the social work process and informs every written word in a log, file or report. A social service worker must be “actively and skillfully conceptualizing, analyzing, synthesizing, evaluating and applying information with the goal of reaching an answer or conclusion.”1 Our answer or conclusion is our professional opinion; our professional opinion gives us the direction to take in addressing the presenting problem of the client. Consequently, without the process of writing, we are unable to appropriately carry out our professional duties. In the student role, writing is of very high importance. Students must learn the difference between the two streams mentioned above. They must understand and be able to apply academic writing and develop proficiency in professional writing prior to graduation. 1 From “Critical Thinking” by Brooke Noel Moore and Richard Parker USA: McGraw Hill, 2003. 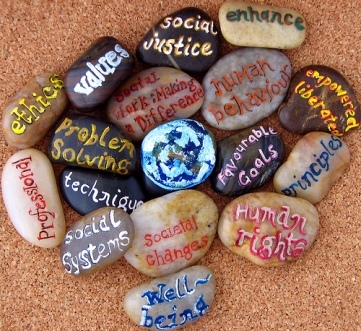 Social service classes are participatory and dynamic. Students are socialized to include themselves in their studies from the first course they take in the program. Their perspectives, their reactions, their experiences, etc. are key in learning how to situate themselves into a new role as professional and understand the boundaries between personal/ political/ professional. The following short writing exercises are meant to be done independently, and during class time. Case Presentation In the third year of the program all students are required, as part of their stage seminar course, to carry out a case presentation. This is a professional activity used for many purposes, for example, to share work, request assistance, brainstorm, or clarify an orientation taken with a given client. Although the main activity becomes the presentation, it is developed through multiple types of writing and interactions (written and face to face) over time. Writing is the main way the professional (student) identifies the important information, problems, impressions, questions and ultimately their professional opinion. It is also used to provide the participants with a summary of the information they need to give pertinent input. In addition to the above described uses of this activity, it is also a time and place to demonstrate the orientation, level of competence and interpersonal skills of the presenter. It is a valuable opportunity to build inter-professional relationships and links to the services or knowledge held by those in attendance. Thus, the succinct, relevant, comprehensive and clear use of language, as appropriate to the context, is of great importance. This is the proposed standardized, explicit rubric, which would be provided with the case presentation assignment. In the workplace the worker can consult colleagues, read examples of reports and submit drafts for consultation that are corrected collaboratively in supervision. This rubric is meant to provide the information that cannot be obtained through such a process, given the constraints of this assignment. Writing is central to all of our activities in the social services, especially when we consider it from a larger rhetorical perspective. Whether students are planning to start their careers immediately upon completion of our program (or to continue on in their studies), their efficacy, reputations, marketability, professional relationships, and competency are largely dependant on their writing skills. Following the most recent program evaluation, the social services program has recently incorporated the formal teaching of writing into the program. At the end of this fellowship I am much more keenly aware of why this is so important. It is my hope that this report will be a valuable resource for the teachers assigned to teach our new writing component. Adaptations are necessary to mould teaching writing, in general, to discipline specific writing in the social services. Writing in the Social Services Field, at the Cegep level, rarely corresponds with essay or thesis driven writing. While this less applicable form of writing was often discussed in the literature we explored in the Writing Across Curriculum Fellowship- many strategies were very applicable. As I read John Bean’s Engaging Ideas, I made furious notes that I kept stuck to the last page of the chapter that spurred them into existence. At the end of the fellowship I reviewed each entry, discarded the redundant, synthesized those which were related to one another, and compiled what was left into two broad categories, “Ideology” and “Strategies.” So, as summarized from, or inspired by Bean, here are some ideological perspectives and strategies as related to writing in the discipline of Social Services at the Cegep level. It is essential to dedicate teaching time to teaching how to write in the discipline. We should not assume the English class will take care of it, and the student will them meld their Social Service specific knowledge into those pre-existing English skills. We should recognize the class struggle inherent in learning academic writing, as well as the inherent accessibility of writing in general to literate students. We should also encourage critical perspectives on writing, without fostering cynicism or the rejection of academic/professional writing by students, writing that is a powerful tool of which they will eventually avail themselves as practicing professionals. And we ought to recognize that there are many dialects or “Englishes” and try to explain the benefits and drawbacks of the use of specific types of language in specific contexts (communicating successfully in the court vs. successfully in the group home). Slang, or what is traditionally considered “inappropriate language,” may be the best tool in certain contexts, while it remains an obstacle to communication in others. In Montreal, given the multi-lingual context, it has been my experience that a lower level of professional writing is often accepted. This must be addressed to help students identify poor writing, and not adopt it as the “correct way to do it”. Citing sources appropriately in academic writing is directly related to professional writing, where all data must be cited and substantiated. A social worker was in fact recently stripped of her professional title for documenting a client as mentally ill without a valid citation, or source, to this effect. i) Think up key “tough questions” that immediately engage the students with theoretical ideas – prior to introducing the theory, e.g. have them represent opposite sides, or give them a time trial to come up with as many explanations supporting divergent views as possible. ii) Where there are errors in written work (spelling, grammar, form, etc,), place x’s in the margin to indicate a problem – do not correct the problem or tell the student what it is, encourage them instead to be curious about looking back at their rubric (or spell-check) to decode the feedback and recognize their own error. iii) The best methods to discourage plagiarism are to teach how to obtain the grades a student wishes to have (this includes teaching how to cite and incorporate citations into written work), and/ or to assign work that requires the student to work from their own experience and perspective as an introduction to their sources. v) Integrating these kinds of remarks into a rubric may look at first sight unconventional, but it can be remarkably effective. For example, consider the following performance levels: 1) The paper demonstrated respect for the reader and the client, 2)the paper seems to disrespect the reader or the client; or, 3) the writer gave the impression that they were competent, 4) the writer seemed incompetent or confused about their function or role; or, 5) the writer demonstrated good advocacy and negotiation skills, 6) the writer seemed pushy or demanding; or, finally, 7) the writer used my time well, 8) the writer wasted my time or made me struggle to figure out what they were asking/ saying. These types of grading scale ideas can help students make the connection between writing, and writing with a purpose and an audience. vi) Use summaries of readings with key questions to demonstrate integration. For example, In chapter X what does Shulman say about roles within a group? 1. Make an argument to agree with one of his points and use an example from your experience. 2. Make an argument to disagree with one of his points and use an example from your experience. vii) While lecture-based course design is often strongly discouraged in contemporary pedagogy, it must be recognized that this is the primary way that information is transmitted in formal professional settings (conferences, grand rounds, case presentations). Avoiding lectures as the sole and primary strategy for teaching may be recommended, but teaching students about how to learn from a monologue/ power point and how to deliver an effective monologue/ power point is also essential. viii) Ask students to give their response to a specific reading or theoretical point. Do not overly prompt them with sub-questions – just give them the rubric that demands the use of critical thought to respond with their perspective/reaction. ix) Give tasks as a thesis that must be supported, refuted, or modified (when not using a single question). This is more effective than using imperatives. For example: “What are the pros and cons of self-disclosure in a helping relationship” vs. “Discuss the use of self-disclosure in helping relationships”. x) Using standardized, explicit rubrics, which are provided with the assignment, allows students to focus on constructing the assignment as desired rather than attempting to decode the wishes and preferences of the teacher. Placing the onus on the student to figure us out is not altogether realistic. In the workplace the worker can consult colleagues, read examples of reports and submit drafts for consultation that are corrected collaboratively in supervision. Use of some of those strategies where possible is recommended in the classroom- but in instances where students cannot consult or see examples with out cheating, then the onus is on the teacher to make the expectations and means to achieve A’s, B’s, etc. explicit. xi) Include small “think-pieces” exploratory informal writing or slightly directed, short written pieces in-class. This can help students get their thoughts down, focus on a specific question, summarize what they have just heard while it is fresh in their minds, and help dismantle writers blocks or feelings of inadequacy in writing. xii) Always give the student an audience for written work, and avoid making the teacher the audience. “Imagine you are explaining this to a layperson…”, “Write this to the judge who will be hearing your clients case…”. According to Bean the teacher is not a logical audience member as the student is aware that you already know what they are attempting to share and can thus get confused about what to include/ how to construct their argument, etc. It is also not a realistic practice exercise for professional writing, as we must learn to write for the audiences for whom a professional will be expected to write. It has been a tremendously enriching experience to take part in this fellowship. I have learned a great deal about myself as a writer and educator- particularly about how to better position myself ideologically to promote more effective learning. I have already started to incorporate new skills and strategies and am excited to have a better guide as to what to keep and what to modify in my old strategies. I hope that each of my colleagues has the opportunity to participate in a similar experience.